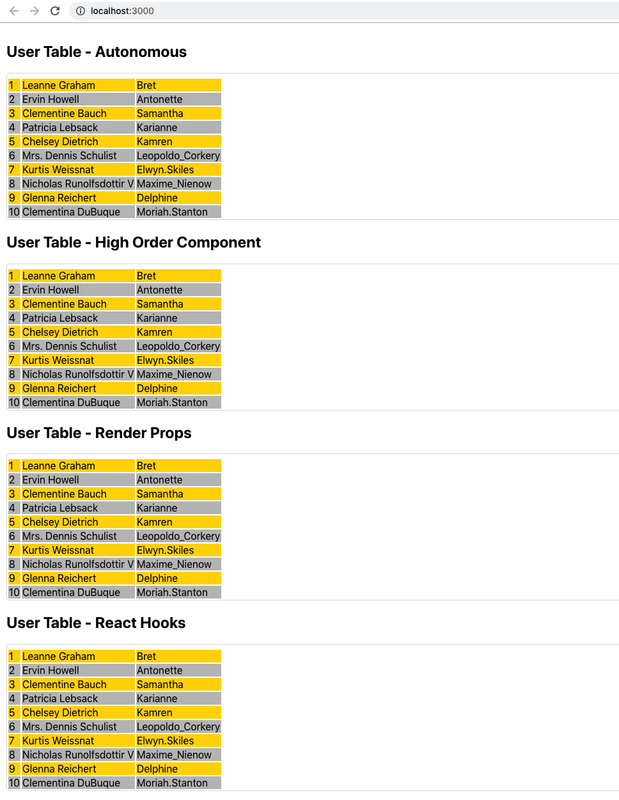 React is great at displaying your data in a hierarchical component view. But how do your components get the data? There are many ways to go about it, each with their own pros and cons. In this article, I’ll cover all the major ways to do so with hands-on examples, as well as their various alternatives. When you’re done reading, you’ll have a clear understanding of the big picture of data fetching. You’ll be able to decide which approaches are the best fit for your application and have some code samples to build upon. The full source code is available here. 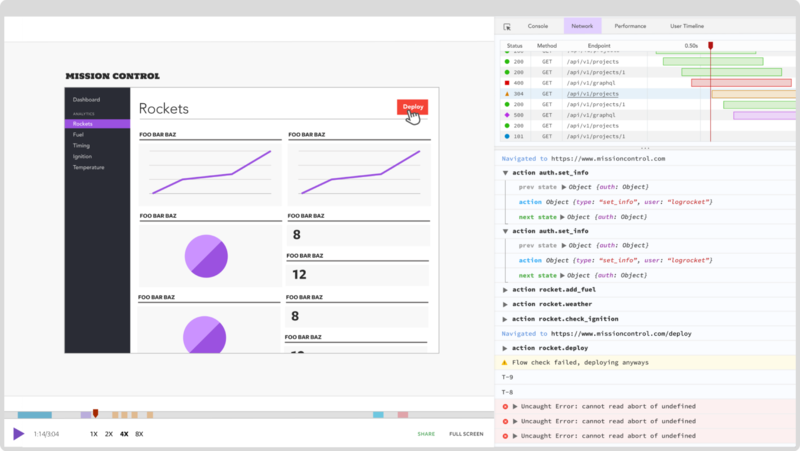 There are quite a few data fetching strategies, and the React team just keeps adding more. In this section, I’ll discuss all the current approaches and provide some context regarding when they are appropriate. The hands-on example is a simple React application with a bunch of components that fetch users from JSONPlaceholder. The JSONPlaceholder API is great when you want to test some front-end code without worrying about writing to your own server or choosing some public API, which may require authentication or change on you and break your code. Read more about it here. All the components render the same data and look the same. I use React Bootstrap Table for the actual rendering in all components, but the components differ greatly in how they fetch the data. This is the old-school way of getting data for your app. The data is embedded in the HTML sent from the server. If you want fresh data, you need to refresh the page manually or have the page refresh periodically. Remember this? Since the component is totally autonomous, nobody (read: no other component) can tell it that it’s time to load its data. In this case, I chose to load the data for the first time in componentDidMount() and also set a timer that will fetch the data again every five seconds. Let’s look at the UserTableAutonmous component and dissect it piece by piece. It’s a standard class-based React component. Its state includes two fields: a Boolean isFetching initialized to false since it’s not fetching yet, and an empty list of users, which are the data it wants to fetch. The render() method renders the BootstrapTable component, passing it the current users from the state. If it’s in the middle of fetching, then a “Fetching users…” message is displayed, too. This is super-rudimentary progress reporting. The bootstrap table will display only the id, name, and username fields of each user, though there are several other fields. As I discussed before, the actual data fetching happens in componentDidMount(), which is the React lifecycle method being called when the component is mounted and ready to go. Some people may argue that it’s better to use componentWillMount(), which is called when the component is about to be mounted and starts data fetching earlier to save time. There are two important reasons against it, however. First, it’s deprecated and will go away in React 17. Second, when you use the Fetch API or Axios in componentWillMount(), React will render without waiting for it to finish, which will cause an empty render for the first time — so you don’t really save any time. Note that componentDidMount() is called after the first render, so you still need to handle the first empty render. In our, demo I use the “Fetching users…” message. Another option is to do your initial data fetching in the constructor, but that will delay the first render of your component. OK, it’s settled — we’ll fetch our data in componentDidMount(). The code simply calls the fetchUsers() method and starts a timer that will call fetchUsers() every five seconds. The componentWillUnmount() method is called when our component goes away, and it’s a good time to stop the timer by calling clearInterval() and setting it to null. I won’t show you the full fetchUsers() method just yet because there are several alternative for implementing it — we’ll discuss it in detail later. For now, just to whet your appetite, here is a redacted version. It sets the isFetching state variable to true, so while fetching new data, the component renders the “Fetching users…” message. Then it gets the users by some “magic” and the sets isFetching back to false. I’m not a big fan of autonomous components; they are too much of a black box. They mix two very different concerns of data fetching and data display, and they are also more difficult to test. Higher-order components are composite components wherein a top-level component is responsible for fetching the data and propagating it to child components. Higher-order components can be arbitrarily nested. The basic idea is to isolate the concern of fetching and distributing the data from the concern of actually doing something with the data. In scenarios where multiple components need different aspects of the data, it is also more efficient because you only fetch the data once. Let’s see how it plays out. The SimpleUserTable component knows nothing about servers, lifecycle methods, data fetching, or error handling; all it does is receive the users list in its props and render them using the BootstrapTable component. It does understand the properties of a user object and expects an id, name and username. The SimpleUserTable cares only about the id, name, and username. If the backend server adds more info or removes/renames some unused fields, this is totally fine. So what fetches the actual data? That would be the UserTableHOC. It fetches the users in its componentDidMount by calling the fetchUsers() method that updates the users, and isFetching is the state. The render() method simply passes the state to the child SimpleUserTable. In practice, we split the UserTableAutonomous into two nested components; the code is pretty much identical, but it’s much cleaner. What’s more, we’re all set in case we want to have multiple components that display user data in different ways. For example, if we want to enable user selection and then displaying the full info of the selected user in another component (e.g. FullUserInfo), the UserTableHOC can just pass the relevant user info to the FullUserInfo component. That sounds great, but there is a lot of work in these cases, such as informing the HOC about selections in child components and passing fetched data through props of deeply nested component hierarchies. So the HOC is not only responsible for fetching data, it is also responsible for rendering the components directly below it in the hierarchy and potentially responding to events originating from these children. Our next data pattern addresses these concerns, but it comes with its own trade-offs. The React pattern is often called render props. The idea is to pass a prop to a component, which is a function and not a static value or object. The receiving object will execute this prop, which is often used in the render() method — hence the name render prop. What that buys you is the ability to deeply customize the way the target component works by replacing parts of its logic with your function. If you’re familiar with object-oriented design patterns, it is similar to the strategy pattern or the template method pattern. The code of UserTableRenderProps is very similar to UserTableHOC. The big difference is in the render() method, which calls its props.children() function. This increases the level of abstraction because the component doesn’t need to know anything about its children. That’s cool, but that means whatever passes the render props up top needs to know about the internal structure. When does it make sense to use render props? 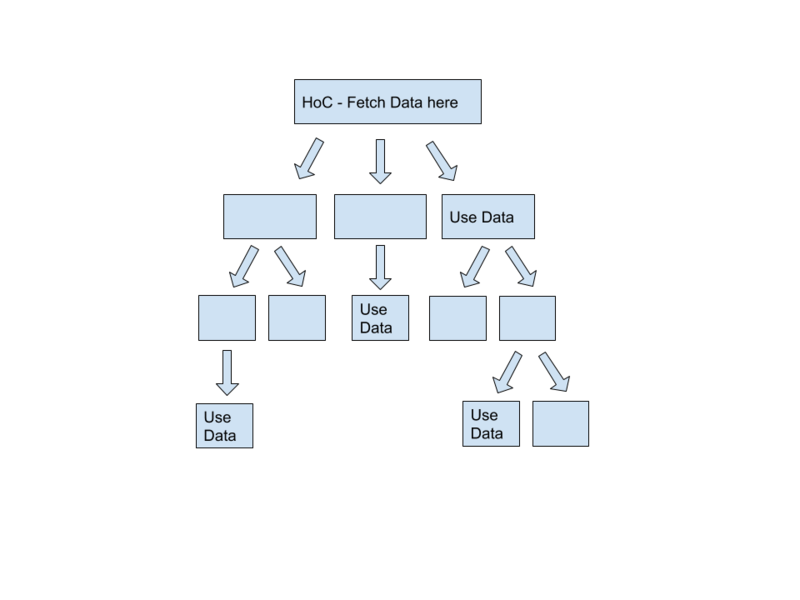 A good example is in a deep hierarchy where the data fetching components can share a cache. In this case, it makes sense to have multiple data fetchers that have different children, as opposed to HOCs, where the children are fixed (hard-coded in the render() method of the HOC component). Let’s take another look at the App() functional component from App.js that passes the children render prop to the UserTableRenderProps. As you can see, it needs to know about SimpleUserTable and pass it along. So far, data fetching required a class-based component with state and lifecycle methods. But React 16.8 brings us Hooks. Patterns such as higher-order components and render props require you to restructure your component hierarchy and/or propagate a lot of state through your hierarchy (either directly with props or with various wrappers, providers, and consumers). In addition, people struggle with classes and the way they are implemented. The idea of React Hooks is to break state management into independent functions that don’t require fitting the round peg of state into the square hole of class lifecycle methods. All of React’s features can be used in functional components and don’t require a class. In particular, we can use React Hooks for data fetching. Let’s examine the code of the UserTableReactHooks functional component. First, the useState() state Hook is called with an initial state. This is similar to the constructor. The Hook returns two values: the current state and a function to update it. Note that you can have multiple state Hooks, which could be useful if you need to update independently different parts of the state. So far, so good. To perform side effects like data fetching, we will use an effect Hook. Effect Hooks accept a function and run it after each render by default. In this case, I want it to run just once, so I pass both a function and an empty array. The array argument tells the Hook to apply the effect (i.e., run the function) only if the state variables listed in the array are changed. Since I passed an empty array, there is no state variable to watch for, and the effect will run just once. You can think of effects as a combination of componentDidMount() and componentDidUpdate() of class-based components. Finally, it just returns the SimpleUserTable with the local state for rendering. Hooks are a cool and ergonomic addition to React. I highly recommend that you get familiar with them. Suspense is a relatively new React feature that lets your component display something as a fallback while it waits for some long-running operation to finish. Obviously, data fetching is a long-running operation, and you may want to display something like a message, progress bar, or spinner while your data is being fetched. Unfortunately, at the time of writing, Suspense for data fetching has not been released — so I’ll have to keep you in suspense for now. (See what I did there?) That said, there is an implementation of a custom React Hook for data fetching compatible with Suspense. I didn’t try it myself, so I can neither confirm nor deny its efficacy. If you’re interested, check it out here. Of course, you can mix and match approaches. If you already have some components that fetch data in a certain way, and other components that use another method, they can all live happily in the same application. But if you’re starting from scratch, using React Hooks — and soon Suspense — will likely be the best path forward. I could have likewise used async/await with Fetch. I arbitrarily used different implementations in different components; they are all exchangeable. The pros and cons are more ergonomic than functional. I’ve used Fetch in the UserTableHOC component. I actually called the function fetchUsersWithFetchAPI(), but assigned it to a variable called fetchUsers, so the component just calls fetchUsers(). I’ve used Axios for the UserTableRenderProps component. Axios also has a promise-based API similar to Fetch, but Axios saves the JSON parsing phase and handles all errors. The Fetch API, for example, returns 404 as a normal response, so you need to check the response in your code and throw an error yourself if needed. The code is almost identical to the Fetch API version, with one less step and more robust error handling. This is my favorite variant without a doubt. The users API is a REST API. How about GraphQL backend? GraphQL servers typically return JSON over HTTP, too. The main difference is that there is one query endpoint to fetch data (ignoring mutations and subscriptions here), and the actual data requested and returned follows the GraphQL schema. The data fetching strategies and tactics don’t distinguish between REST and GraphQL, and they’ll work equally well on both. Now, WebSockets or gRPC are a different story — we’ll leave that for another day. We covered a lot of ground in this article. 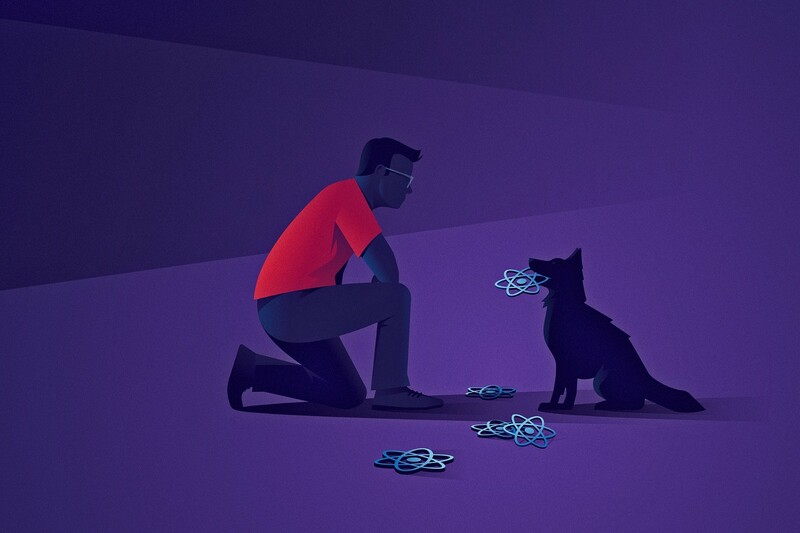 We explored all the common React data fetching strategies and tactics. We weighed the pros and cons of each approach and demonstrated each one in code. At this point in time, I would go for React Hooks and Axios using async/await syntax. In the near future, it would be interesting to check out Suspense for data fetching.